To most, vacation means a break from reality in every sense of the term: a break from waking up early, a break from going to the office, and, if we're being honest, a break from eating mindfully. But the idea of grubbing healthfully while you're taking a break from your busy schedule doesn't need to feel like a burden: In fact, we'd argue that taking care of your body while you're traveling is grounds for a more enjoyable getaway. We get it, though: When burger joints and steak frites are calling your name on the road, it's hard to practice abstention. That's why we tapped three top nutritionists for their tried-and-true methods for eating healthy no matter where they're headed. Thankfully, they're all super doable. Take a look for yourself below! If you're stuck on carrot sticks as the only healthy snack to travel with, Alissa Rumsey, MS, RD, and author of the free e-book Three Steps to a Healthier You can fix that. "Bring along nutritious snacks so that you'll be prepared in case you're stuck somewhere with not great food choices or if you're in transit for awhile. Beef jerky, nuts, dried or fresh fruit, individual packets of nut butter, dried chickpeas or beans and whole grain crackers all pack and travel well." Isabel K. Smith, MS, RD, CDN, also has great packable snack options: "Lettuce wraps; turkey wrap; avocado and other veggies in a lettuce leaf; roasted chickpeas, open-faced sandwich (lose one half of the bread, really—load it with vegetables in addition to your protein; raw veggies like carrots, cucumbers, and celery and combine with hummus or guac (both sold in individual packets); and greek yogurt—it's satisfying and a good source of protein—which is why it's satisfying! Worst case, bring a packet of protein powder and mix with water." Ali Wender is a big advocate of nutrition bars. "In my snack bags, you'll find lots of bars (current favorites include RxBar and GoMacro), grain-free granola, mixed raw unsalted nuts, dark chocolate, and individual nut butter packets. Airports always have bananas somewhere (in the lounges, at the coffee shops, etc. ), so in a pinch, a banana with nut butter is the perfect snack to hold me over until I reach my destination." Smith says she "hates fast food," but for those who don't want to be the stick in the mud of the group (though we'd never judge you for your healthy choices), she suggests going to In-N-Out Burger and ordering a patty in a lettuce wrap. If you do Mexican, Smith advises getting a fajita. For diners, she's a fan of omelets or a burger (skip the bun)." 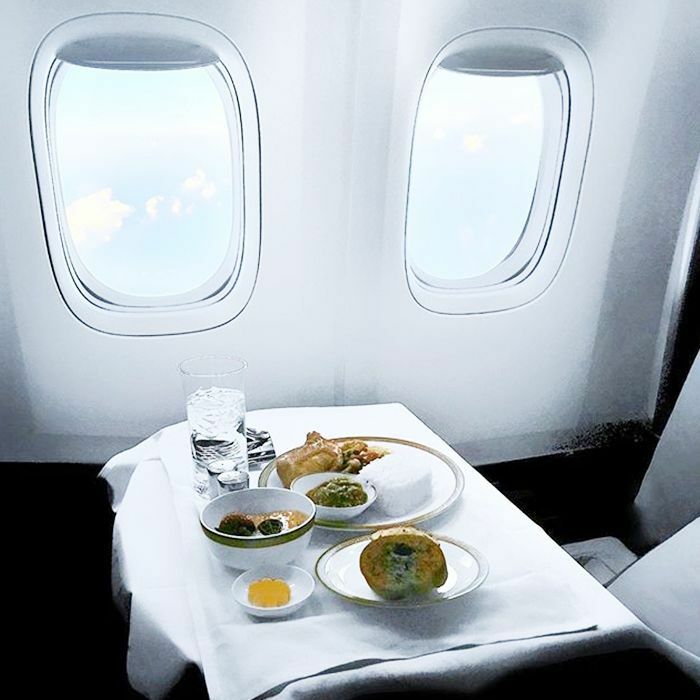 She also has a genius action plan for ordering food on common flights: "Some airlines will have boxes to go—look for something with either protein or vegetables—JetBlue has boxes of kale quinoa salad. I love these because they're loaded with fiber and will help prompt satiety. Delta has snack packs that are protein focused—I love these for the same reason: satiety. Skip the carby stuff unless you're in a real pinch with no other options." "You can't always plan for everything while traveling, so stick to your routine and arm yourself with healthy snacks to balance the occasional splurge," says Wender. Adds Rumsey, "Eat what you love; leave what you don't. Enjoy the new and special foods that you really love, but skip those that you don't really care about. Choose to have the foods that you love and enjoy the most, instead of just eating certain things because they are there. I love to try the items that are truly special and unique to the place I'm visiting, like fresh goat cheese and jamón in Spain or the yummy cheese tarts in Lisbon." What's your favorite on-the-go snack? Please share your yummy (and healthy) picks below!